NETWORK UPDATE: SUNDAY NIGHT FOOTBALL adjusted up to 7.1. Elsewhere, both 60 MINUTES and the I LOVE LUCY CHRISTMAS SPECIAL fell by 0.1, while THE SIMPSONS and FAMILY GUY gained the same amount. With the gigantic presence of THE WALKING DEAD removed from Sunday cable for the next couple of months, Discovery owned 3 of the night’s top slots, led by the 1.77 for its EATEN ALIVE special, and with that show’s NAKED AND AFRAID lead-in and DNEWS lead-out respectively at 0.99 and 0.92. 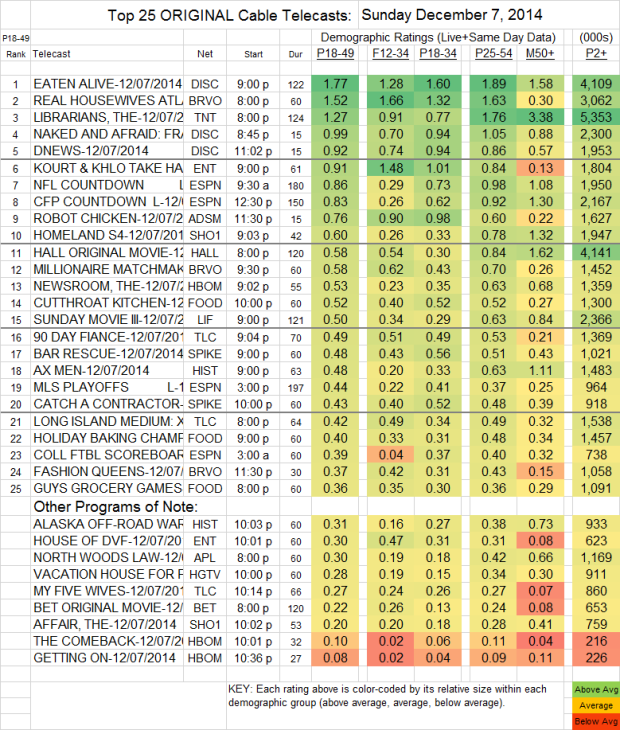 REAL HOUSEWIVES OF ATLANTA (Bravo) gained 0.18 to 1.52, with MILLIONAIRE MATCHMAKER at 0.58 and FASHION QUEENS at 0.37. THE LIBRARIANS (TNT) got off to a very good start at 1.27. KOURTNEY & KHLOE (E!) lost 0.13 to 0.91, and lead-out HOUSE OF DVF dropped 0.08 to 0.30. ROBOT CHICKEN (Adult Swim) was at 0.76. On Showtime, which had taken last Sunday off, HOMELAND was at 0.60, and THE AFFAIR was at 0.20, up respectively 0.01 and down 0.03 from 2 weeks ago. HBO’s THE NEWSROOM each ticked down to 0.53 and 0.10, and THE COMEBACK was down 0.02 to 0.08. In response to a very serious Food Network fan, GIADA AT HOME was at 0.18/916K, GUY’S BIG BITE was at 0.18/791K, SOUTHERN AT HEART was at 0.22 and 870K, and FARMHOUSE RULES was at 0.20/769K.